with grants for UL professors. social events and educational opportunities. Friends of the Humanities invite you to our SPRING LUNCHEON Friday, May 4, 2018 at 11:00 a.m. at the Petroleum Club of Lafayette 111 Heymann Boulevard. Enjoy a Buffet Extravaganza for $30. Come see a presentation by Shane K. Bernard, Ph.D, "Teche: A History of Louisiana's Most Famous Bayou." Dr. Bernard is a Fellow at the Center for Louisiana Studies, a Historian and Curator to McIlhenny Company, and author of Teche: A History of Louisiana's Most Famous Bayou, which was chosen as a 2017 Book of the Year by the Louisiana Endowment for the Humanities. To reserve your place complete the reservation form and mail it with a check to Friends of the Humanities, PO Box 53581, Lafayette, LA 70505. Or, pay online through PayPal. 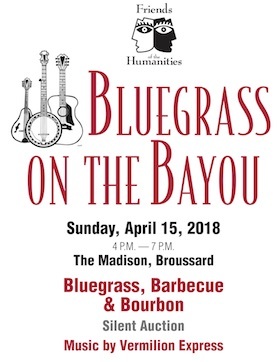 Friends of the Humanities invite you to our Bluegrass on the Bayou fundraiser Sunday, April 15, 2018 from 4-7pm at the Madison in Broussard. The fundraiser includes music, food, and beverages, and a silent auction. 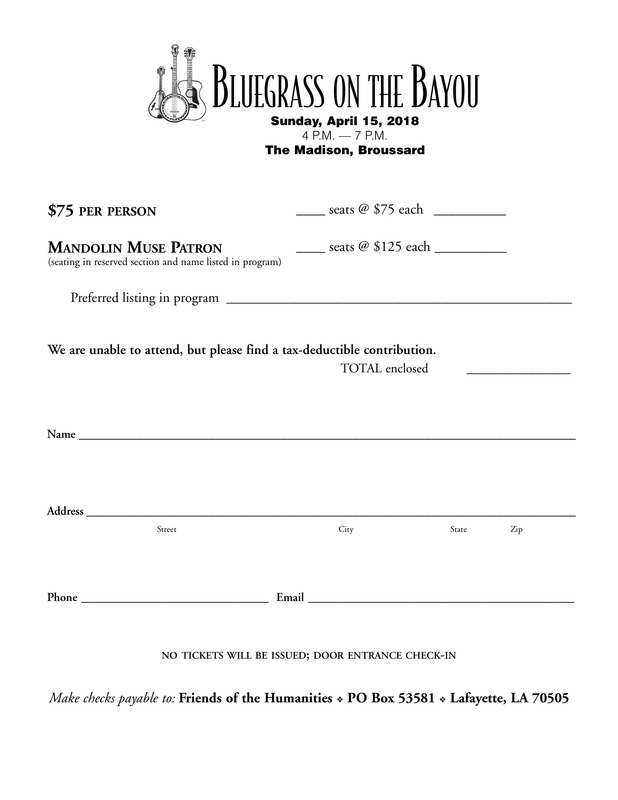 Help support the Humanities at the University of Louisiana at Lafayette by reserving your tickets ($75) or becoming a Mandolin Muse Patron ($125). Mandolin Muse Patrons are seated in a reserved section and have their names listed in the program. Read the sponsorship letter for the features and benefits of each level. To become a sponsor complete the sponsorship form and mail it with a check to Friends of the Humanities, PO Box 53581, Lafayette, LA 70505. "Friends of the Humanities have made a bigger difference in the humanities at UL Lafayette over the past three decades than any other group or organization." “Our faculty and programs have benefited from the scholarships and grants from The Friends. We are indebted to them for their support."